The Florida International University Shay Nonen Soccer Camp is for 13 to 18 years old female soccer players. It is a 3-day camp from July 21 to July 23, . In essence, the camp will be an effective, competitive, and fun training environment. It is an opportunity for players to learn collegiate level skills and tactics. The camp will also focus on developing positive players habits. The camp facilitators are the Florida International University women’s soccer coaching staff. It will take place in FIU Soccer Complex. A top-notch training facility. Registration includes a Nonan Soccer Camp t-shirt. Limited slots are available to provide personalized coaching and evaluation. Florida International University is a public research university. It is a member of the State University System of Florida. It is also an affiliation of the Southern Association of Colleges and Schools. The university is Tier 2 in the National Universities, edition of Best Colleges rankings. Then, it is 183rd in the Business Programs rankings. And, 5th in International Business rankings. The university has around 200,000 competitive alumni. Currently, the total students population is around 55,100. The university has 14 varsity teams. They are participating in the Conference USA of NCAA Division 1. Their nickname is Panthers. Blue and gold are their identity colors. The women’s soccer team have already 3 Sun Belt Conference Regular Season titles. They have also 2 Sun Belt Conference Tournament titles. The FIU women’s soccer head coach is Sharolta Nonen. She is a former assistant coach at East Carolina. Her playing career includes a 1999 World Cup playing experience. She was then playing for the Canadian National Team. Correspondingly, she earned a spot in the All-Tournament team. Coach Nonen is a United States Soccer Federation Class C coaching license holder too. The team’s assistant coach, as well as the recruiting coordinator, is Brian Periman. Finally, completing the coaching staff is Nika Cleary, the Director of Operations. 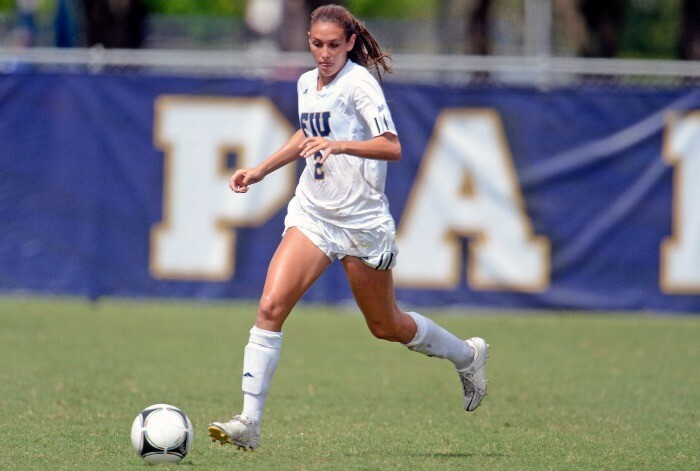 The Florida International University Shay Nonen Soccer Camp is an effective, competitive, and fun training environment for female soccer players.